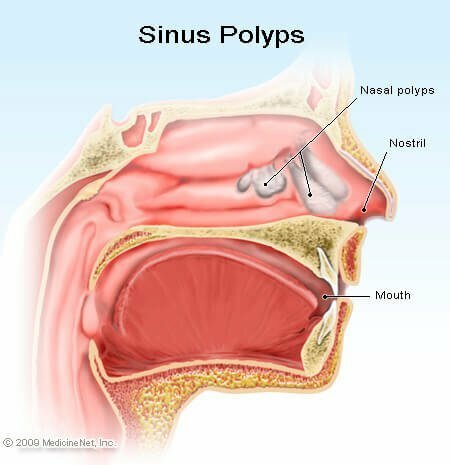 Nasal polyps: Benign growths that originate in the mucous membranes lining the nasal passages or paranasal sinuses. Polyps are believed to arise in the nasal mucosa as a result of chronic inflammation. Up to 4% of adults have nasal polyps; they can also occur in children, particularly those with chronic respiratory conditions such as cystic fibrosis. Symptoms include postnasal drainage, snoring, headaches, sinusitis, and a reduced sense of smell and taste. Therapy can include oral and topical steroid medications or surgical removal.